Today- July 16, 2010 marks the 65th anniversary of the first nuclear weapon explosion – named “Trinity”. 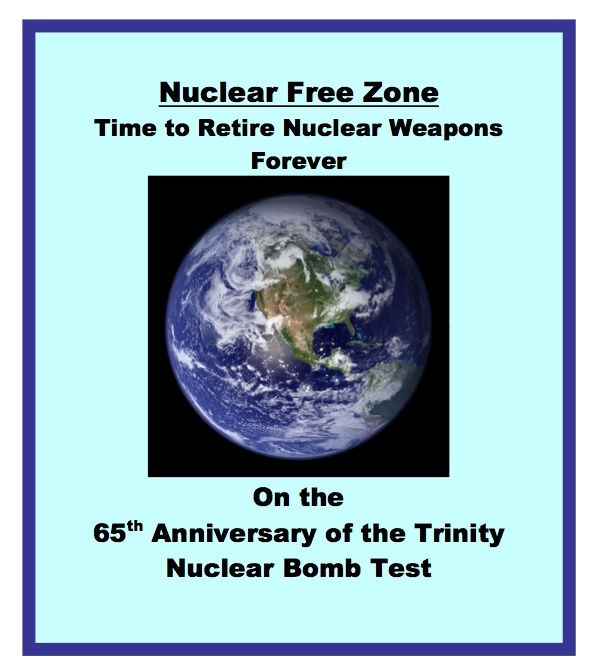 Some have noted that, as age 65 is the traditional “retirement” date, now is the time for us to seriously work towards retirement for nuclear weapons. In an interconnected world, there is no need to have nuclear weapons. These weapons make us less secure. On this 65th anniversary of embarking on the Journey of Death, we must change course and move back from the nuclear precipice. The weapons are illegal, immoral, undemocratic and militarily unnecessary. The surest way to bring them under control is by negotiating a new treaty, a Nuclear Weapons Convention, for the phased, verifiable, irreversible and transparent elimination of nuclear weapons. The United States led the world into the Nuclear Age. President Obama has pointed out that the country also has a moral responsibility to lead the way out. This can be done, but not with a citizenry that is ignorant, apathetic and in denial. Sixty-five years on the Journey of Death is long enough. It is past time for citizens to awaken and become engaged in this issue as if their future depended upon it, as it does. Human security is a right. In an interconnected world, each person has a voice. We each can educate ourselves, our families, our friends, our communities and our representatives to the truth about the fact that nuclear weapons make us all less safe.